Pairing the healing and transformative power of symbolic art and focused meditations, Healing Body Meditations is a set of 30 beautiful color mandalas with accompanying healing meditations, all based on the chakras and the natural miracle of the human body. Meditating on these unique designs--which each focus on a particular chakra and an organ, body part, or system such as the heart, eyes, lungs, or skin--draws upon the endless power of the spirit as a force for physical healing, allowing us to tap into our inner springs of vitality and help restore our being to wholeness and balance. The 30 mandala meditations have been specially created to enhance the meditator’s relationship with his or her own body, ease common symptoms of imbalance and stress, and address specific health concerns, including headaches and migraines, joint stiffness, fatigue, anxiety symptoms, and chronic aches and pains. Organized around the 7-chakra system, the book introduces each chakra in depth along with signs of an over- or underactive chakra and a mandala meditation to strengthen the chakra. This is followed by specific meditations on individual physical, emotional, mind, or soul aspects the chakra regulates as well as meditations for pain relief and energy boost, supporting the skin and senses, and tuning connections within the brain to help with mind and memory. The book also illustrates how clearing the chakras with visualization and meditation can boost energy, enhance the immune system, and bring a change of perspective to everyday life. 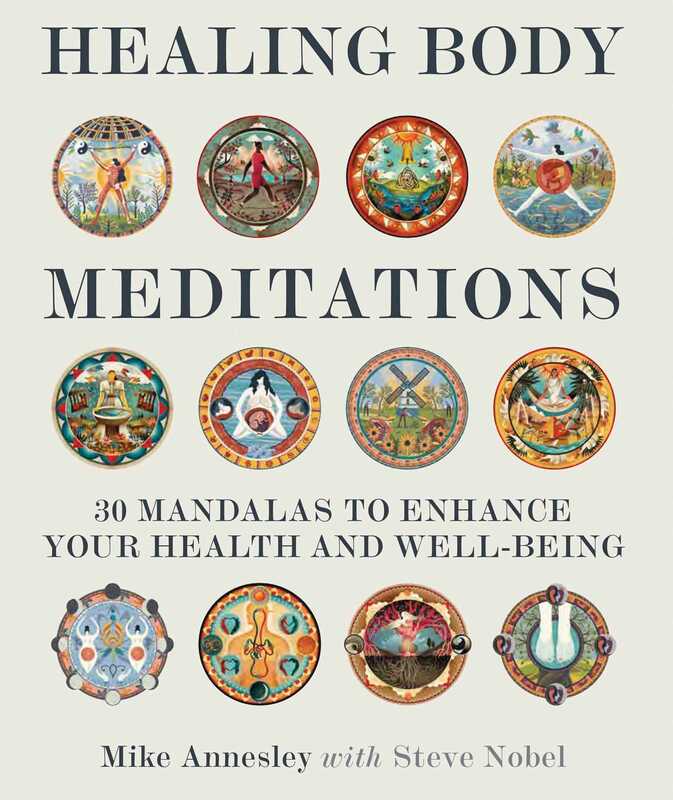 With rich symbolism and beautiful artwork, these healing body meditations provide an engaging and effective tool to balance, heal, and stimulate body, mind, and soul. The solar plexus chakra is the core of who we are: our identity or personality. From this source our will power draws its strength. Seated just above the navel and below the rib cage, this energy centre brings us confidence in our being and in our effectiveness within the world. It enables us to convert passivity into action, and to meet any challenges we may encounter on that journey of transformation. This is the chakra of being proactive rather than merely reactive. Meditating on the Solar Plexus Chakra Mandala releases an awareness of empowerment in ourselves. We are confirmed in our conscious control over emotions and thoughts. We knowingly have power to choose--and this includes choosing healing rather than stagnation, actively seeking a cure for what can be cured, and living a life as full as possible, despite any condition deemed incurable. Blockage of this chakra can cause mistrust of people in our lives and too much concern about how we are seen. When the chakra is in balance, we appreciate our own qualities and the unique contribution made by others to our mental, emotional and physical well-being. The solar plexus chakra meditation takes its strength from the sun - hence the yellow colouring of this mandala. By drawing solar energy into yourself, and activating the chakra, you can access creative passion and summon the will power to take transformative action and rise to any challenges. Sit comfortably with the Solar Plexus Chakra Mandala in front of you. Empty your conscious mind of worries and preoccupations and turn your attention to the rise and fall of your breathing. Inhale and exhale slowly. Be aware of yourself becoming more relaxed with each in-breath and, with each outbreath, moving deeper into awareness. Now turn your relaxed attention to the mandala. Run your gaze over the main features of the mandala image, starting with the outer frame and working inwards. Contemplate the ten lotus petals, then within them the inverted triangle with its T-shaped appendages (comprising an ancient sun symbol), and then the central glyph, which summarizes the chakra’s essence: the core self, which is the source of our will power and action. Think of the symbolism of the mandala: the lotus representing sacred life emerging out of the physical body, and the inverted triangle, meaning self-development or inner blossoming. Think, too, of the colour yellow representing the life-giving power of the sun. It is this, as well as any rain (figuratively speaking) that falls into your life, that enables that inner blossoming to take place. Imagine the colour yellow suffusing this chakra as a limitless outpouring of solar energy. Picture that energy as an envelope of power not only in your mind but all around you - including under your feet where you sit. With your mind draw that power up into the solar plexus chakra just above your navel and below your rib cage, where it rotates clockwise. Picture that rotation within yourself. You have used the mandala to flood yourself with an energizing, healing tonic. Know that this healing tonic will provide you with the strength to convert your potential into effective action. You are equipped to make any internal or external changes you deem necessary, and to respond well to any challenges that come your way. As your gaze penetrates the root chakra symbol, imagine that the energy in your solar plexus chakra is flowering within you, in a process fuelled by your inner sun as well as the sun above. The inverted triangle is a route map for creativity. The flowering is also a blaze of passion - the “fire in your belly”. Feel creative passion filling you, and in particular giving strength to your digestive system, with which this chakra is closely connected. Relish this state of passionate engagement. When ready, take your attention back to the mandala. Anxiety can chisel away at our well-being on an everyday basis, even to the point of making us ill. A mandala meditation can help us to separate ourselves from our worries and find a core of tranquil self-awareness within. We all know what it feels like when our thoughts flit restlessly around worries. Meditation can help us to calm the inner swarm--or storm--by taking us back to a simple awareness of being. This restoration of inner peace will probably not be permanent, but with repeated meditation practice it can in due course become so. At its worst, anxiety affects our physical well-being. It can cause muscle tension, nausea, headaches, pain in the stomach, back, shoulders or throat, or even joint pain or tingling hands and feet. A meditation may be used as a quick-fix solution to give us a refreshing break from our preoccupations or, when performed regularly, as a long-term method of reducing our symptoms by adjusting our relationship with our own thoughts. In this mandala meditation anxieties are imagined as a swarm of locusts that are shepherded out of harm’s way. Visualizing this scene has the benefit of separating us from our worries. Taking physical form in the imagination, as prompted by the mandala, the anxieties move away from our own being, where they are part of us, into an enclosed space in the outside world, where they are part of us no longer. This is a technique that can be applied to our emotions too. The underlying principle is that the impact of our anxieties and emotions can be brought within our own command. We can choose to banish or disable their effects, for a healing period that hopefully will outlast the meditation itself. They can only disturb our peace of mind if we give them permission to do so.